Download this IDC Research Report to learn how to achieve a more connected and information-centric business network. Many supply chain leaders have a lack of control over their operations. 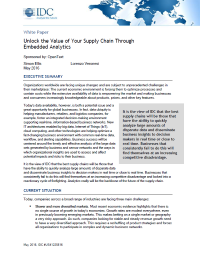 Companies should look for ways to better apply analytics across their supply chain to enable the nimble and insightful decision making that will be required for business success.